Active learning classrooms are teaching and learning environments designed with a more student-centered teaching approach in mind. 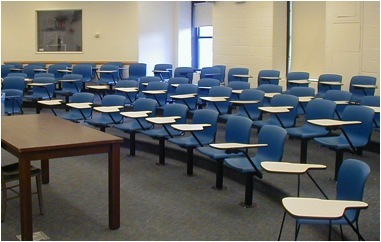 These spaces often include modular furniture that can easily be rearranged and reassembled, moveable writing surfaces, and integrated technologies that support instructors’ desires to increase their students involvement by integrating media, peer-to-peer interaction, and collaborative learning activities into their teaching. A key feature of active learning classrooms is their flexibility; the furniture and design choices allow for various room configurations, respond to natural traffic patterns and the “flow” of learning and teaching in that space, and accommodate diverse groupings of students. This design principle of flexibility creates a class environment that can transition easily between class components or activities, like an instructor’s presentation, small group work, or student-led demonstrations. As you might imagine, these types of classrooms expand options for teaching and help support the many ways that different students learn. Active learning classrooms are popping up all over our UW-Madison campus and in higher education environments, but these classrooms have long been a key element of primary education (think the square, four-person tables of a kindergarten classroom or moveable group work tables in a middle school lab setting). 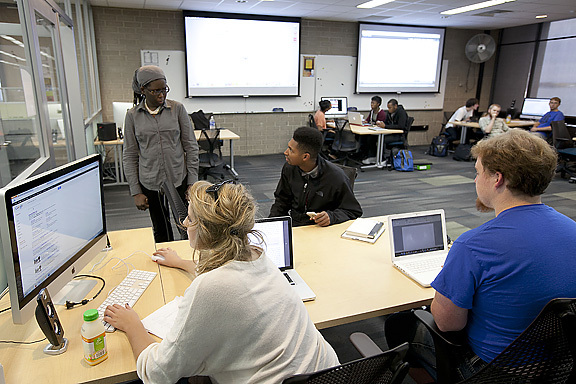 Scale-Up (Student-Centered Active Learning Environment for Undergraduate Programs) is a leading national organization that helps to support, define, and advocate for active learning spaces in higher education. 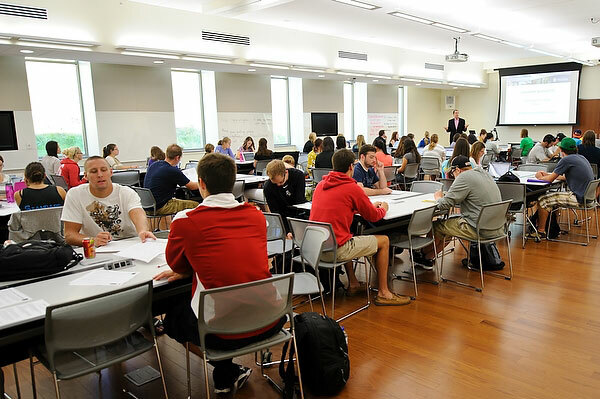 Many of our peer universities are also highly engaged in active learning classroom design and implementation and have produced helpful resources encouraging others to build active learning classrooms on their campuses. The University of Minnesota and McGill University both have very well regarded active learning classroom initiatives and are actively publishing current research on best practices for active learning spaces and class environment design (for instance, see McGill’s report on their 2009 active learning redesign). 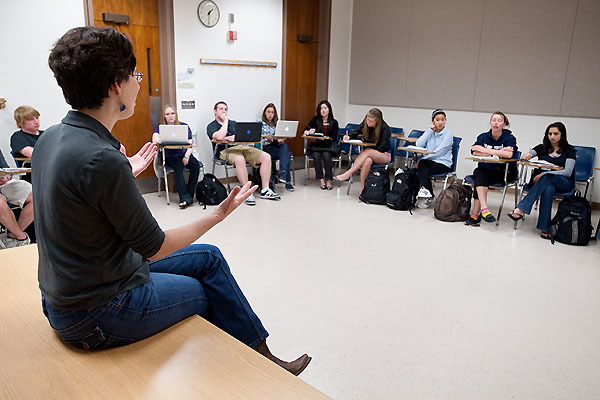 The UW-Madison has been quite engaged in active learning classroom redesign, especially for new buildings and classroom remodeling projects. Take a look at some of the great initiatives on our very own campus! Just one floor below the WisCEL space in College Library are the Media Studios (connected to the DesignLab space). These bright and welcoming classrooms support courses that integrate digital, multimedia, or otherwise collaborative project-based assignments and design into the curriculum. These are the classrooms that Jim Brown describes using in this week’s podcast. You can read more about the adjacent DesignLab and its connection to these spaces in this library news article from last year. If you’re interested in teaching in one of these space, see the news item we posted last week. Make sure that you get your application in soon, as these spaces fill up quickly! An artist’s rendition of one of the new active learning spaces planed for Signe Skott Cooper Hall. 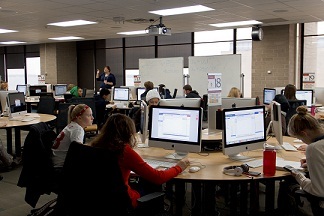 The UW-Madison’s School of Nursing has long been involved in active learning initiatives and is one of the main innovators of active learning space use on our campus. Their new building, Signe Skott Cooper Hall (currently under construction near the Health Sciences Learning Center), is based entirely on scalable and sustainable principles of active learning classroom design. Beth Fahlberg, who you can hear more from in this week and last week’s podcast, has written a useful guide to what works best in an active learning space, based on the School of Nursing’s experience with active learning classrooms. The School of Human Ecology’s new Nancy Nichols Hall (opened in 2012) and the renovated Education building (renovations completed in 2011) are not only a great example of active learning classroom design (as seen in the SoHE Learning Hall at right) but also of great space design in general! Each of these buildings incorporates myriad flexible learning and teaching spaces for collaborative work, presentations, studying, and small group projects. Many unique flexible classroom spaces exist on our campus, tucked away in various buildings and hallways. 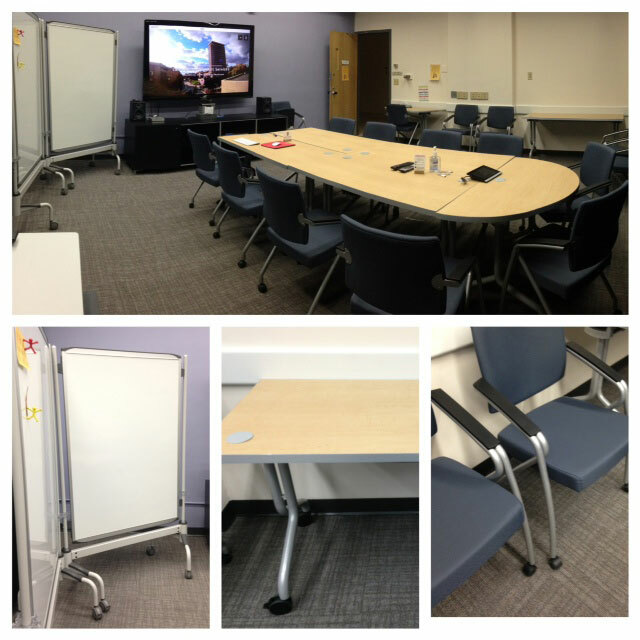 One example is our new videoconferencing and collaboration space in 290 Van Hise. This space, like other flexible learning spaces on campus, incorporates modular furniture, a movable teaching station and standing whiteboards, and integrated technology and media support to enhance teaching initiatives and active learning-based course design. Come down to 290 Van Hise to check out the space! in a typical classroom space at UW-Madison. Photo by Jeff Miller. Many spaces you already teach in! The rooms to the right likely look familiar to you as representatives of more traditional classroom spaces around campus. While many of the spaces we use on a daily basis weren’t built with all of the affordances of active learning in mind, with a little bit of imagination, some elbow grease, and a willingness to reconceptualize your classroom environment, these too can become active learning spaces! Now that we’ve discussed several considerations for active learning spaces, design, and environments, we’d like you to explore ways that you’d make a more traditional teaching space more friendly to active learning. This can be either very conceptual or wholly practical, depending on what’s most helpful to you: you can completely redesign the space (ignoring any structural or pragmatic limitations) or just reorganize the room (moving furniture around, bringing furniture in, etc.) to accommodate an active learning activity. The sky’s the limit! Pick a space you teach in or have taught in OR use the sample small lecture room at right as your template. Identify some changes you’d make, and share them in the discussion space. Chime in with ideas and feedback for other class participants, too.